Anyone would love to make their home a comfortable and pleasant place to stay at, and a big factor in that is the air quality inside. You’ve probably experienced this - when you come home from holiday, or you haven’t opened the windows in one part of the house for a few days, it starts to get stuffy and uncomfortable. However, even if you do open the windows regularly, you may still experience poor air quality in your home. This can often be attributed to the air ducts. When were your air ducts last cleaned? 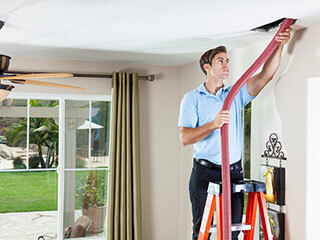 It’s easy to live in a home for years on end without ever thinking much about the air ducts. But as time goes on, dirt can accumulate inside, and this can affect the air that’s put through. If your air ducts are dirty, the air that comes into the home can bring bad smells with it. Just like dirt can accumulate, so can dust, and the particles may get blown through the vent and into the home. The air will likely not be so dusty it looks foggy, but there may be a subtle veil of dust around the home and on the furniture. This can impact your family’s health in the long run, and is generally easy to avoid - as long as the ducts are cleaned regularly. Years of accumulating dirt and dust can clog up the air ducts. Furthermore, if something has accidentally fallen onto or squeezed the air duct. All of these issues can cause the air in the home to become stale, which over time will make it less comfortable to live in. The solution of course is fairly simple – have the air ducts and HVAC system professionally cleaned at least once a year, and you will enjoy fresh, clean air indoors for long years to come!